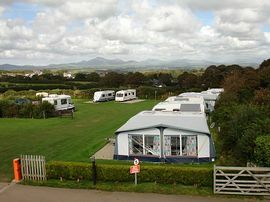 A haven for campers, Bolmynydd Park is a reputable family run 4* Welsh Tourist Board site nestling in the shelter of Llanbedrog headland with unmatched views of the coast, the Lleyn Peninsula and the mountains of Snowdonia. Without doubt an idyllic and peaceful setting. Within easy walking distance of Bolmynydd there are two glorious beaches, a well stocked grocery shop, family pub and cosy bistro. The excellent facilities at Bolmynydd are complete with central heating, power showers, baby changing, fully fitted laundry room, dishwashing room and freezers for ice packs. The reception area has a well stocked camping accessory shop and a comprehensive tourist information display together with a convenient payphone. With four camping fields to choose from there are a variety of pitches to suit everyone, with many pitches having electric hook-up points, if required. Bolmynydd's peaceful location is ideally suited for walking to either Llanbedrog or Tyn Tywyn beaches or exploring the 500 acres of neighbouring headland. The bustling village of Abersoch is 2.5 miles away and can be accessed by car or along the coastline via Tyn Tywyn beach. The local shop can provide all your grocery requirements and the local pub is renowned for its excellent food and family atmosphere. A499 from Pwllheli to Llanbedrog. Carry on towards Abersoch for 0.5m. Take first left lane after riding centre. The Park is 0.5m on left. Pitch prices per night includes car, tourer, tent or m/van, plus 2 adults and children up to 3 years old.